Become Armed With The Facts! The obvious potential reward for orthodontic treatment is straighter teeth that are less prone to decay – but just as important is the boost to self-confidence that a better smile can provide. 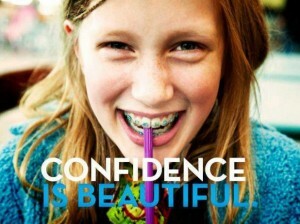 Metal braces, Clear braces, Invisalign aligners, and other options can help you achieve that confidence. Adults now account for 25% of orthodontic patients. Treatment can be successful at later ages because the biological process involved in tooth movement is the same in adults as it is in children. As you prepare to make decisions about orthodontic treatment, it’s very important to be armed with the facts. 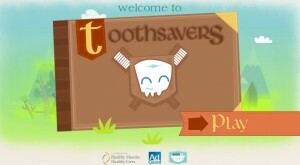 New Gaming App Inspires Kids to Brush Two Minutes, Twice a Day! Orthodontics can boost a person’s self-image as the teeth, jaws and lips become properly aligned — but an attractive smile is just one of the benefits. In certain cases orthodontics is necessary in order prevent the wearing down of tooth enamel. Orthodontics is also important in many cases where patients may be missing teeth. The orthodontist is able to position the teeth properly before the missing teeth are restored by their dentist. No one can deny the importance of a winning smile. It makes a pleasing appearance, promotes self-esteem and is valuable to social and career success. Creating beautiful smiles is what orthodontics is all about. And today, orthodontic treatment is so convenient and affordable that individuals from childhood through retirement can reap the important benefits. Orthodontic treatment is important not only for a great smile and improved self-confidence, but for better dental health. Braces fit easily into today’s active lifestyles. They’re comfortable, easy to keep clean and less visible than in the past. 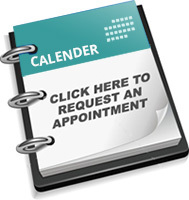 New techniques and materials can extend the period between appointments, saving time and expense. The American Association of Orthodontists recommends that every child should get an orthodontic screening no later than age seven. 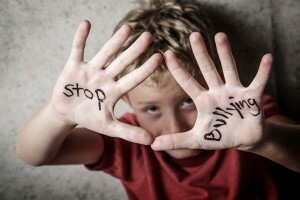 Although they are evaluated at seven, this does not mean they will need to begin orthodontic treatment at this time. At age seven, Dr Couser can tell you what to expect when your child becomes 11 or 12 years old and their adult teeth are in or close to being in. This helps the parents prepare for when that time comes. There are a small minority of cases that do benefit from what is called early treatment or Phase I treatment. This is typically done when the patient is between seven to nine years old. If at this age your child has a cross bite, underbite, or is self conscious about their front four adult teeth then doing some early treatment will provide a benefit. 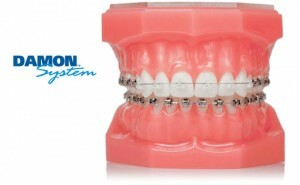 Braces straighten and correctly position your teeth to give you a great smile. Braces consist of brackets that are glued to the teeth and the wires that connect them to one another. There are many types of braces to choose from, including traditional, self-ligating, clear, and lingual (hidden behind the teeth). Of course an alternative to braces is Invisalign® which is a series of clear removable aligners that cover the teeth. The right age can be any age. Full orthodontic treatment with braces generally starts after all the permanent teeth are in place, usually between 11 – 15 years old. Teeth will straighten whether you are 7 years old or you are 60 years old. Certainly not the estimated 1 million adults in the United States who have chosen orthodontic treatment as the route to better oral health and emotional well-being. Adults are discovering that today’s high-tech materials are light-years away from the “metal mouth” look they may have been familiar with as teenagers. Invisalign (clear aligners) and clear or tooth colored bracket options are recent innovations that use sophisticated engineering to ensure less time is spent in braces. Can it be too late for a person to be fitted with braces? No, its never too late because healthy teeth can be moved at any age. Orthodontists can improve the smile of practically anyone. 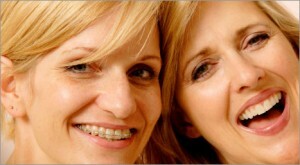 In fact, orthodontists regularly treat patients in their 40′s, 50′s and older! Cost will vary, of course, depending on the nature of the treatment plan. You may be surprised to discover that orthodontics is less expensive than you thought. We offer several options to help ease the cost of your braces. We will work with you to find a payment plan that fits your budget. We offer several interest-free payment options. To make things easier for you, we file insurance claims for you and offer automatic bill pay. Of course, when considering your investment it is important to keep in mind the lifetime value that orthodontic treatment provides. 1. Use toothpaste containing fluoride. You can also get a fluoride rinse from your orthodontist or family dentist to help prevent cavities! 2. It’s important to limit foods that are sugary. They increase the bacteria in your mouth and cause more plaque to develop on your teeth, opening the door for cavities. 3. Avoid hard bread, hard candies, ice cubes or nuts, or any food that could become stuck in your braces, such as taffy. Sticky foods like Skittles and Starbursts will not break your braces but it is very difficult to remove these foods from your braces. If you do not remove them from around your braces they will cause damage to your teeth. You can chew sugar free gum. 4. Keep going to your family dentist every six months for a checkup and cleanings. Every patient is different and responds to treatment differently. Some treatment times can be as little as six months or as long as 30 months. On average, standard orthodontic treatment with braces is completed within 18 months. Braces usually don’t hurt. They’re made out of materials that are much more comfortable than they were decades ago. However, you may feel mild tenderness or some irritation for a few days as your gums, teeth, mouth and cheeks adjust to new braces.